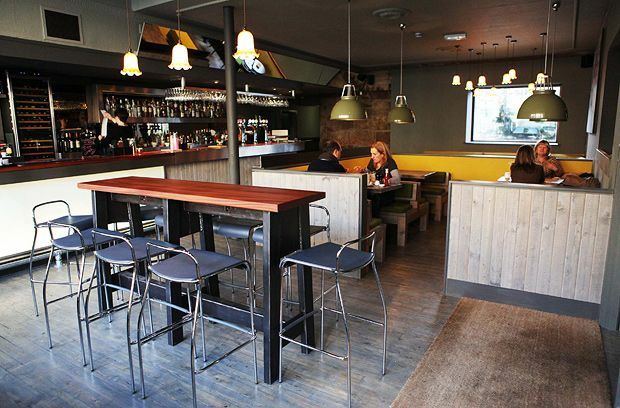 Bungo is the kind of neighbourhood bar-restaurant where locals might drop in several times in a day. On one side it’s an inviting pub serving excellent beer and welcoming kids and dogs, on the other it’s a casual but proper dining room. The food offering is the same either side of the divide, and works through from brunch – Scottish, Mexican and Lebanese breakfast dishes – to all-day mains and small plates. Burgers, fish and chips and pasta are joined on the menu by more exotic creations featuring Indian and North African flavours. The small plates work as bar snacks and starters, or assembled into a spread for sharing. Among these, beetroot gnocchi are pan-fried for an unusual and satisfying crunch and served with a gentle wild garlic pesto, while chargrilled chicken skewers come with a sweet-hot Korean take on satay sauce. Excellent hand-cut chips are enlivened by a sprinkle of rosemary salt. Weekly theme nights – curry Mondays, steak Thursdays and so on – are a good-value fixture. Music on stereo: Bruce Springsteen etc. Quizmaster Neil hosts your chance to get your mits on a load of mystery prizes.